For the first time on DVD, see the original theatrical version of the film as it was initially released in theatres. After a lunar cataclysm brings the Klingon Empire to its knees, the foreign concept of peace with the Federation may be finally within reach. Ironically, it is Admiral James T. Kirk who is the first emissary to broker that peace. 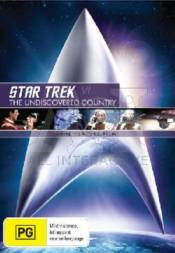 Yet all hope is virtually lost when the Enterprise and crew are implicated in the brutal assassination of a Klingon diplomat bringing both worlds to the brink of full-scale war.